to walk leashed dogs in a public park! Police Department to dog owners: "Let me see your papers" ?!? Hello fellow dog lovers! I am new to this group and would like tointroduce you to an outrageous ordinance ("Bramson's Bullying" - he's our Mayor) enacted April 1st of this year in New Rochelle. In brief, the city now requires dog owners who wish to walk withtheir pets in a 62 acre open parkland called "Ward Acres" (purchasedwith state funds) to get a PHOTO ID and pay $50 (residents) and $250 (non-residents) per dog per year. The photo ID and fees apply whether you are walking on or off-leash as the city has allowed somevery limited off-leash recreation. The city is deliberately directing armed police officers to enter thepark, STOP law-abiding citizens and demand to see their photo IDs.Many long-time users of the park are now AFRAID to go there.Penalties of up to $250 and FIFTEEN DAYS IN JAIL are possible. WE HAVE YET TO FIND ANY MUNICIPALITY IN AMERICA THAT DOES THIS. This ordinance is illegal under NY state law, we believe, and it has needlessly destroyed a decades-old community of dog owners who have peacably shared their lives and pets together in Ward Acres mostly off-leash. You can go to our web site www.WeLoveWardAcres.net for more info and read about the lawsuit that has been filed. 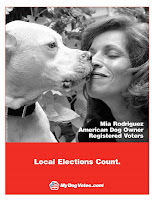 We are publicizing this issue in advance of the Nov 6th elections andwe have a Voters Guide on our web site which identifies dog-friendly New Rochelle candidates. This fight is much more than an on/off leash issue. These rules violate our civil liberties and even apply to on-leash dog walking.We NEED ALLIES in this fight as the city is dismissive of our entreaties. If this ordinance stands, look for municipalities near you to try the same thing! Not satisfied with the October 12 "debate"? Not a problem! 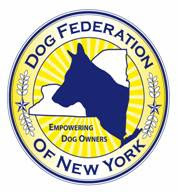 We will continue a discussion of NYC and NYS dangerous dog laws, and the myths and misinformation that the proponents of breed specific legislation--such as NYC Councilman Peter Vallone Jr.--use to support their position. Councilman Vallone is an outspoken proponent of breed specific legislation, and would like to ban pit bulls from the City of New York. If you are in the New Rochelle area, tune in! If you're not, listen live via the internet! So, once again, set the automatic coffee brewer, and put the phone on "do not disturb"! You won't want to miss a word!